A family of teeny-tiny people known as "borrowers" live peacefully under the floorboards of a country home. But then one of them — a young girl named Arrietty who is just learning to go "above" to scavenge — is spotted by a houseguest, a sickly young boy. The two develop a tentative friendship, just as the housekeeper seeks to rid the house of the intruders, forcing Arrietty and her parents to go on the run. The animation is gorgeous, especially the scenes which depict the garden with lush, painterly backgrounds. And viewing our ordinary world through Arrietty's eyes is especially magical; we sense her awe when she sees her first human-sized living space, where even teapots must be scaled with ropes. 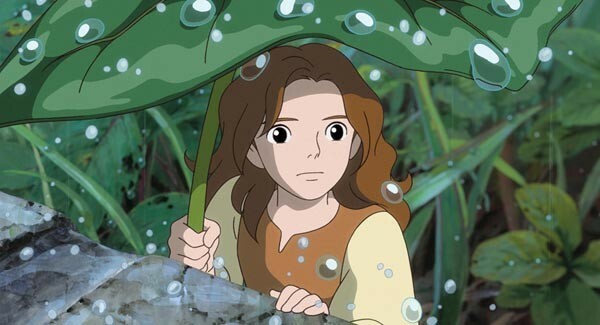 On the upside, Arrietty is an admirable and likable character (clever, brave, loyal and sensitive), and the wonderful Carol Burnett voices the crotchety housekeeper. But some kids (and a few adults) may find the film too slow, especially without the frantic action and comedy sequences that most animated family films dole out. Those with more patience may be rewarded with a sweet, if slight, story.